Mississippi is a place I think of for moonshine more than beer but the Lazy Magnolia Brewing Company is changing that. This is the first beer that I have tried from them and had heard good things. I was a bit skeptical if I was going to like this at first because I'm not a huge fan of pecan pie. 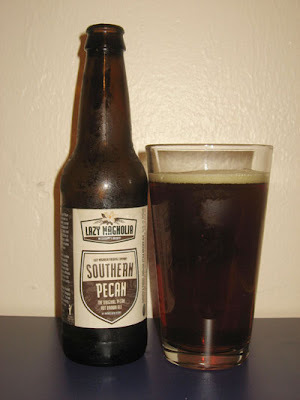 Though the beer does have the sweet nutty taste of a pecan pie it doesn't overload you with sticky sweetness. It has a nice dark brown color that goes very well with the whole theme of the beer. The smell of nutty maltyness just made me want to put this to my lips. The tastes were the perfect blend, a bit of sweetness with a very slight bitterness you would expect from a pecan. The mouthfeel was not overwhelmingly sticky, like I was expecting. It actually had a nice bit of carbonation and medium body to it. The roasted malt finish was a great finish to what could be one of my go-to session beers. I picked this beer up while I was in Naples so start requesting it at local stores and bars hopefully we will see it over on this side of the state soon enough. My girl just returned from Tampa yesterday and brought me back a bottle. Thanks for the review. I have never heard of the brewery before but I'm looking forward to trying this pecan flavored brew. I tried it when I went home to S. MS to visit family...loved it. 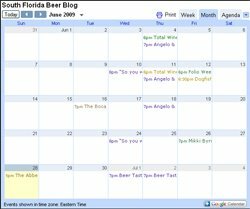 Yes, it's a shame we can't get it here in Broward County yet, but I've contacted Lazy Magnolia asking them to please find a distributor here.